With so many Vitamin C supplemental products being sold online and in stores claiming to offer the best Vitamin C Benefits, it can be difficult to wade through the options as to what is important for your body to have and what can help your body function at its very best. We all know Vitamin C Benefits are vitally necessary for our bodily systems to operate at optimal levels, but are there differences within classes of Vitamin C? Are there any clinical and scientifically demonstrated pieces of information that show more diverse levels of applicability and use among everyday consumers and/or patients? Throughout this article, we will specifically discuss a general overview of the Best Vitamin C Sources in 2019, Vitamin C Benefits, how supplementing your health with it can benefit handfuls of health problems, as well as, the clinical settings indicating when you should use Vitamin C with R-Lipoic Acid over a regular Vitamin C Supplement. Use Code “Save5” for 5% off your order! What is Vitamin C and What Are the Health Benefits Associated? Everyone knows Vitamin C is important. My first memories of health was a Vitamin C Supplement. Every morning, my grandfather would give me a spoonful of a liquid Vitamin C Supplement paired with a liquid Calcium Supplement. I am fond of those memories because I loved the taste. Believe it or not, I looked forward to waking up to my daily Vitamin C dosage. But really, what is Vitamin C? 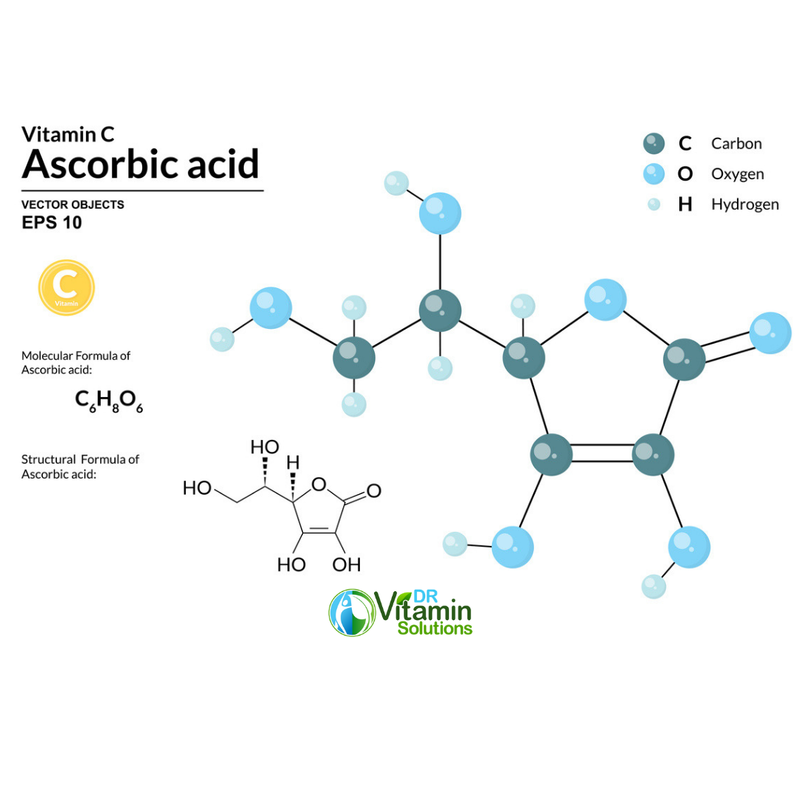 Vitamin C, also known as Ascorbic Acid, is an essential vitamin, meaning that it is not produced by the body naturally and therefore must be taken actively to maintain active levels. (1, 2) It is water-soluble, though, so it can be found in fruits and vegetables in appreciable amounts. (3) This is opposed to other vitamins such as A, D, E, and K which are fat-soluble and can remain stored in fat sources throughout the body. The current clinical recommendation for adult females is listed at 75 mg per day, while it is recommended that adult males consume 90 mg per day. (4) Vitamin C, as pictured below, contain 6 Carbon Molecules, 8 Hydrogen Molecules and 6 Oxygen Molecules. In this study, participants were taking 500 mg or more a day dosage vitamin C from supplements. (15) The take home message here is that it’s important to not only include vitamin C in your diet, but also to provide some supplemental vitamin C to take those benefits to the next level. It is also worth noting that these studies have mainly focused on male participants, but that females have experienced similar results. Blood vessels throughout the body are lined with muscles of varying thicknesses and react differently to the pressure of the blood flow. When the vitamin C was consumed, a noticeable decrease in pressure was found for blood traveling from the heart to other parts of the body. Overall, diastolic and systolic pressures decreased for healthy individuals, with an even more pronounced decrease being seen in those with existing high blood pressure. Iron is a very important component of red blood cells in the body and are the site where oxygen is attached during respiration. Without the proper amount of Iron in the body, tissues are deprived of oxygen, which can lead to serious problems such as anemia, chronic tiredness, shortness of breath, heart palpitations, localized pain, and frequent infections. With the use of Vitamin C supplements, however, these problems associated with deficiencies dramatically decrease as vitamin C supplements have been found to increase iron absorption to a high degree. It was determined that simply taking a 100 mg vitamin C supplement daily improved iron absorption by 67 percent! 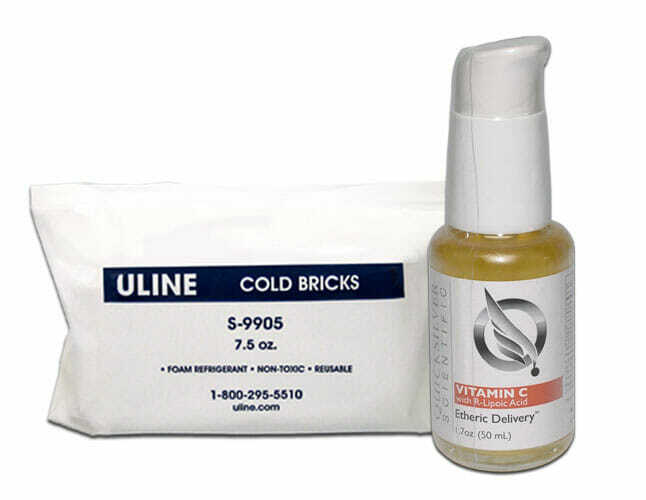 Other studies have shown complete reversal of anemic diagnoses through the consistent usage of vitamin C supplements. There are numerous Vitamin C benefits that can improve your immune system. Immune Support is a scientifically proven benefit of Vitamin C, this study showed that although Vitamin C cannot fight every cold; it can shorten the time you are sick (17, 18, 19). Vitamin C naturally boosts vitality of white blood cells (20). Most importantly, adequate levels of vitamin C increase production levels of white blood cells (WBCs) which are tasked with fighting infection and foreign invaders. Secondly, these WBCs are further protected by the antioxidant properties of vitamin C, ensuring that they maintain their integrity and can function more effectively in phagocytizing (devouring) toxic bacterial and viral entities to prevent infections. One additional benefit is that vitamin C helps assist the skin with acting as an external barrier to harmful germs. These Vitamin C Benefits can further be seen by supplementing your vitamin C intake. For Eye Health – Scientific studies have established a connection with high levels of Vitamin C and a reduced risk of Cataract formation (21). For Anti-Aging – Maintaining your daily intake Vitamin C 1000 mg can promote anti-aging skin benefits (22). For Cell Protection – Vitamin C can help protect your cells from free-radical damage by boosting levels of Glutathione (23). For Immunity – As discussed above, Vitamin C is a strong antioxidant that can help reduce conditions associated with high levels of oxidative stress such as anxiety and depression (24). To Reduce Blood Pressure – Vitamin C can help relax blood vessels, promoting healthy blood flow (25). There is no current direct correlation to vitamin C intake and weight loss, however, there have been some hypotheses on whether there is any connection. It is believed that during moderate to intense periods of exercise, there are higher levels of oxidation of fat on the body, resulting from the consumption of higher levels of vitamin C. One undisclosed factor in this assertion that was not considered concerned the notion that those individuals who tended to take more vitamin C more than likely were already healthier to begin with, despite any physical activity. Additional work needs to be done to make more conclusive statement of the efficacy of vitamin C on potential weight loss. How Much Vitamin C Is Too Much? What Are Potential Side Effects? While it is difficult to consume too much vitamin C, as it is water soluble and not stored within the tissues of the body, there still can be unwanted effects. (26) The most common problem that is associated with consuming too much vitamin C is gastrointestinal. It is likely if an individual is taking more than 2,000 mg per day, that they can experience symptoms such as nausea and diarrhea. Another possible side effect that could arise, although exceedingly rare in nature, is that of an over-absorption of Iron. Some individuals might have predisposed conditions such as hemachromatosis which allow for higher than normal levels of absorption of iron. (27) In situations like this, it is important to be cautious with taking too much vitamin C.
Lastly, consuming too much vitamin C could potentially lead to the development of kidney stones. (28) When vitamin C is metabolized, it leaves the body through the urinary system as oxolate. (29) In high concentrations, oxolate can bond together and crystallize, leading to kidney stone formations. If you have a past medical history of developing kidney stones, it’s best to consult a physician on the amount of vitamin C that is most appropriate for your health. Provided that vitamin C only stays within the body for several hours before being excreted, it is important to know the upper limits for consumption. The potential side effects previously discussed only seemed to manifest themselves above levels of 2,000 mg per day; however, it is important to discuss any concerns or questions with your physician to understand the optimal levels for you and your health before deciding to ingest any large amounts of vitamin C.
How Can I Best Increase My Vitamin C Levels? Try the Quicksilver Scientific Liposomal Vitamin C Featuring Quali-C from DSM. Let’s begin with this question: Do you know where your Vitamin C comes from? I’m not talking about an online retailer or brick-and-mortar health store; I am talking about the actual location where your Vitamin C Supplement is made. Quicksilver Scientific Liposomal Vitamin C Featuring Quali C from DSM has taken DSM Vitamin C and combined it with their innovative Liposomal Technology. Quicksilver’s Liposomal Technology delivers the highest absorption by combining the Vitamin C with a fat to increase its absorption rate. Vitamins which are not bound to a fat will not absorb into the bloodstream, making them fairly useless. Liposomal Technology removes all doubt in terms of absorption. You will not be able to experience the vast Vitamin C Benefits if your body cannot absorb at least 500 mg of Vitamin C dosage. Liposomal Technology removes all of the guess-work so you can enjoy Vitamin C Benefits. The Liposomal Vitamin C dietary supplement by Quicksilver Scientific featuring Quali-C from DSM offers a powerful, natural, and effective way for you to get your daily dosage of vitamin C and more to help maximize Vitamin C Benefits. Made up of only sodium, Quali-C Vitamin C (European Sodium Ascorbate), water, glycerin, phospholipids, and natural citrus oils, the supplement comes in a liquid form that is phospholipid encapsulated and utilizes a liposomal delivery system which optimizes the bioavailability within your body to assist with free radical scavenging and overall antioxidant activity. The liposomal delivery system is very important because it inhibits the natural degradation that would be seen in taking other vitamin C supplements, ensuring that you’re getting every bit of the dosage you’re taking through proper absorption. Additionally, this proprietary supplement helps your immune system to target bacterial and viral activity and promotes cardiovascular health by moderating blood pressure. 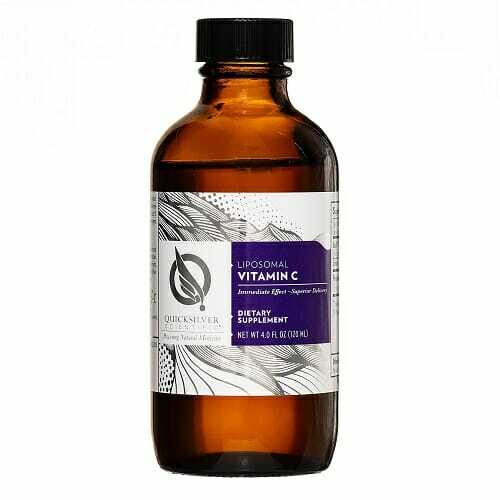 It is by far the most superior vitamin C supplement on the market and Quicksilver Scientific has made it a point to create a natural and highly effective regimen. To maximize its potency, buyers are given the option to ship the product on ice, preventing any breakdown of the natural ingredients during the shipping process. The Liposomal Vitamin C dietary supplement is also very easy to take! Simply take one teaspoon by mouth and hold for approximately 30 seconds. It can be mixed with water, but is best on an empty stomach. Use Code “Save5” for 5 % off your order! How Can I Improve Vitamin C Activity and Absorption? The Answer is with R-Lipoic Acids and Its Complementary Mechanisms of Action. On the topic of Vitamin C benefits, what makes regular Vitamin-C different from Vitamin-C with R-Lipoic Acid? Whether you’re looking for general information on how to keep your immune system at its strongest, attempting to correct a vitamin C deficiency, or need help mitigating neuropathies (nerve pain) associated with diabetes or other causes, you’re sure to find it below…. What is R-lipoic acid and what does it do when combined with vitamin C? It’s best to initially describe what lipoic acid is and its functionality within the body. Lipoic acid is an organic compound that functions as a powerful antioxidant, naturally occurring. Lipoic acid does occur in different forms that are called isomers, but R-lipoic acid is the only naturally occurring compound and is produced in small quantities by the body. Specific antioxidant benefits associated with lipoic acid include inflammation reduction, better overall nerve functioning, lowering of blood glucose levels, and decreased skin aging. (33) Additionally, lipoic acid has been prescribed by physicians for over twenty years to combat diabetic neuropathies or pain associated with diabetes. Other possible benefits include memory retention, weight loss assistance, and decrease in heart disease factors. Most of these effects are a direct result of the antioxidant properties and ability to help regenerate other antioxidants. Fortunately for this compound, there are no significant negative interactions associated with taking lipoic acids aside from moderate itching or mild nausea. The benefits far outweigh any side effect that might manifest, and individuals can take up to 2,400 mg per day without issue. Most importantly, however is that R-lipoic acid greatly assists with the overall activity of Vitamin C making it more effective, while also activating the glutathione system, which works to protect cells in the body from the oxidative effects of foreign toxins and metals (chelation). What’s The Most Effective Vitamin C Supplement with R-Lipoic Acid? This Quicksilver Scientific Vitamin C dietary supplement combines the liposomal delivery and phospholipid encapsulation systems with the added support for lipoic acid. But what makes this Liposomal Lipoic Acid specific supplement more effective? Using nanospheres composed of lipids, the surface area is dramatically increased, promoting drastically higher rates of absorption and increasing the efficacy of vitamin C and R-lipoic acid all together. Furthermore, this Liposomal Lipoic Acid product has demonstrated its remarkable ability to cross the blood brain barrier to remove toxins and other destructive compounds and work directly at the cellular level. This is the perfect product to give your immune and cardiovascular systems the extra boost to seek out and find toxins to promote an overall healthier you! Click Here to Discover Quicksilver Scientific Vitamin C with R-Lopic Acid – The Best Vitamin C Sources with R-Lipoic Acid in 2019! What Foods Are High in Vitamin C? Can I Still Obtain Vitamin C from Food and Supplements Together? Vitamin C can be found in appreciable amounts in foods such as fruits and vegetables, but that’s not news to anyone. Many people run to citrus fruits to get their daily vitamin C, but there are many other options that you may not have known about. Some surprising vitamin C high foods include rose hips, chili peppers, thyme, and parsley. And yes, you can eat these while taking vitamin C supplements. The amount of food that would be required to overdose on vitamin C is astronomical, so it is perfectly safe to take a product like the Quicksilver Scientific Vitamin C Supplement or Vitamin C Supplement with R-Lipoic Acid. Oranges – Vitamin C in Oranges ranks as one of the best natural foods to boost Vitamin C (35). Small amounts of orange juice is acceptable, a 6 once glass of Orange Juice contains 95 mg of Vitamin C. Try to stick with whole, organic oranges. Red Bell Pepper – You might be wondering, “which fruit has more Vitamin C than an orange?” The answer is one cup of Red Bell Peppers. Did you know one cup of chopped Red Bell Peppers delivers three times more Vitamin C than an orange (36)? One orange contains 63 mg of Vitamin C, one cup of chopped bell pepper weighs in at 190 mg! Broccoli – Broccoli Vitamin C is a powerhouse, one head of Broccoli contains 132 Mg of Vitamin C (37). Parsley – Simply 2 tablespoons of Parsley can deliver 11% of your needed daily intake Vitamin C 1000 mg.
Kale – Kale is a Vitamin C Superfood. One cup of Kale can deliver 90% of your daily intake. Be sure to experiment with boiling and steaming Kale as this method causes the Kale to release more antioxidants than Raw Kale (38). Although steaming provides more antioxidants, one cup of steamed Kale only provides 60% of your daily needed Vitamin C.
Conclusion. Vitamin C Is a Must for Your Day to Day Life. Overall, the benefits of Vitamin C are unrivaled, as it helps prevent chronic diseases through strong antioxidant properties, reduces the risk of heart disease, prevents high blood pressure, assists with iron absorption, boosts the immune system and other immunity-related functions, and may have a role in weight loss and management. With the Quicksilver Scientific Vitamin C line of supplements available, there is no excuse to not get your daily dosage so that you can live a happier and healthier life! Thank you for taking the time to read Vitamin C Benefits; Best Vitamin C Sources in 2019.